An apparent conflict of interest has arisen in the choice of the company Pacific Environment to do research for a committee, chaired by the NSW Chief Scientist and required to provide independent advice to the NSW Planning department for its assessment of the WestConnex Environmental Impact Statement. The committee is the Advisory Committee on Tunnel Air Quality (ACTAQ), which has the dual roles of researching air quality in tunnels and providing independent advice to the Planning Department on EIS air quality assessment for large road projects such as Westconnex. Pacific Environment is contracted by the Sydney Motorway Corporation (SMC) to provide the assessment of air quality impacts of all WestConnex tunnels for its EIS. The choice of a company that has a large commercial stake in Westconnex to assist in the supposedly independent ACTAQ research is an apparent conflict of interest. The independence of the Chief Scientist’s office in its approach to WestConnex is already a sensitive issue. This became clear when SMC CEO Dennis Cliche told an infrastructure conference last November that the Chief Scientist’s submission to NSW Planning had been ‘extremely complimentary’ in its assessment of WestConnex ventilation stacks. The Chief Scientist, Professor Mary O’Kane, rejected his comments as “false and misleading, calling into question her integrity and independence’’, and said they could undermine ‘community confidence in the integrity of her office’. Mr Cliche withdrew and apologised for his remarks. Pacific Environment has ridden to the top of Australia’s air quality assessment industry on the back of its contracts with SMC to assess air quality for three WestConnex tunnels. It was subsequently commissioned by ACTAQ to carry out out a study evaluating the use of its GRAL air quality assessment model, which it is using to assess air quality for all WestConnex projects. GRAL is a model that was developed in Europe but had not previously been used in Australia. After review by a UK-based expert, Pacific Environment’s study was published on the Chief Scientist’s website in October last year. Since 2014, NSW Roads and Maritime Services Department (RMS) has paid Pacific Environment more than $7 million for its assessment and monitoring of air quality for WestConnex. Its last contract for $546,000 for one year’s air monitoring was published on the NSW tender database in October last year. This does not include a big contract for WestConnex Stage 3, which is not publicly available. Councils, the EPA and the Health Department along with thousands of community groups and citizens have been critical of the Westconnex air quality assessment. City Hub became aware of Pacific Environment’s study for the ACTAQ last week. Surprised that the Chief Scientist’s Committee would commission the very company using the model for its WestConnex EIS to evaluate the model, City Hub contacted the Chief Scientist’s office. We were told that the Committee’s secretariat is based in RMS. In response to questions, RMS media supplied the names of the people on the Committee which includes Professor Mary O’Kane, RMS CEO Ken Kanofski, NSW Chief Health Officer Dr Kerry Chant and an independent expert Dr Ian Longley, who is based at National Institute of Water and Atmospheric Research in New Zealand. 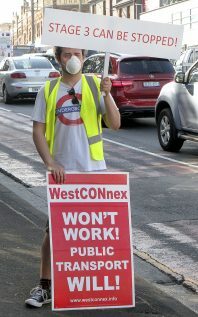 The Environment Protection Agency, which has been critical of the WestConnex EIS, has only observer status. City Hub submitted a series of questions to the Chief Scientist including: Did she consider that the choice of Pacific Environment to do the research could be perceived as a conflict of interest, given Pacific Environment has been responsible for conducting the air quality EIS for the M4 East, the New M5 and the M4/M5 link? If not, why not? And who paid Pacific Environment for the research that has been done for the committee? What amount was the company paid for this study? Professor O’Kane herself has resigned as Chief Scientist, and is moving to her new position as Chair of the NSW Planning Assessment Commission. She was congratulated by the Minister for Planning Anthony Roberts on her performance as Chief Scientist and welcomed to her new role at the Commission, which has approved a record number of State Significant property development projects over the last three years. The State Significance classification is highly controversial because it weakens environmental protections. The spokesperson explained that when the ACTAQ decides to do the research, it sets up a steering committee to manage the project. The spokesperson did not explain why Pacific Environment was chosen but acknowledged that “conflicts of interest are important” and the ACTAQ works to prevent and manage them, including by engaging independent expert reviewers and by publishing raw data on the web. Both of these steps occurred in the case of the Pacific Environment GRAL study. It is true that the study only made recommendations for ways in which GRAL could be used in future road projects. But the line between that and recommending its use is a fine one. No one explained why Pacific Environment rather than a company not involved in WestConnex was chosen to do the research. The close relationship between the ACTAQ and the RMS will reinforce community scepticism about the integrity of the approval processes for Westconnex and other tunnels. Dr Longley, who also reviews the EIS for the Chief Scientist, declined to comment on whether he is paid by the Chief Scientist’s Committee or RMS which submits the EIS on behalf of the Sydney Motorway Corporation. The issue of the lack of independence in the work of the ACTAQ is simply the most recent in a series of conflicts of interest in relation to Westconnex. Others include the contract with AECOM to manage the Westconnex EIS process although it had other commercial contracts in Westconnex; ARUP’s role in assisting the Department of Planning to evaluate the New M5 although it had contracts with Westconnex; and the Federal Department of Infrastructure’s choice of major law firm Allen Linklaters and AECOM to advise it on a $2 billion concessional loan to Westconnex, although both companies were heavily involved in working for the Westconnex project. Wendy Bacon was previously the Professor of Journalism at UTS. Chris Nash is a Professor of Journalism at Monash University. They have both campaigned against WestConnex.